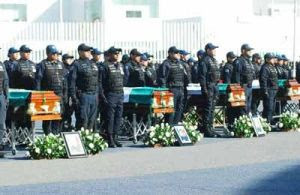 The five Mexican Federal Police officers who died last week in the operation that killed La Familia Michoacana drug cartel boss Nazario Moreno were buried with full honors. 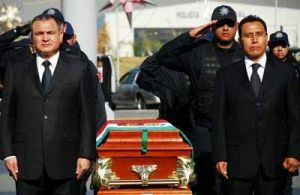 A funeral was held Saturday in Mexico City for the fallen officers, who were slain in a series of engagements last week with La Familia gunmen in the western state of Michoacan. Public Safety Secretary Genaro Garcia Luna, relatives, friends and colleagues of the officers attended the service in the capital. Federal Police Commissioner Facundo Rosas praised the fallen officers for their bravery and honesty. “We are sure, however, that their work and sacrifice will contribute to making it possible for future generations of Mexicans to live under conditions of peace, security and harmony, what we all yearn for,” Rosas said. The officers were “heroes willing to do away with unscrupulous criminals who use their illegal resources and violent acts to try to scare society and move it away from the path of legality,” Garcia Luna said. Drug cartels’ attacks on federal officers are “desperate” acts, the public safety secretary said. “Now, more than ever, it is clear that the criminals, when they see themselves pursued and feel trapped, try to get the authorities to withdraw,” Garcia Luna said. 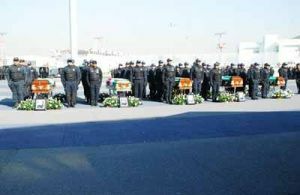 The families of the fallen officers will receive pension benefits, life insurance and medical coverage, as well as educational benefits and financial support for minor children, the Public Safety Secretariat said. Officials have launched “Coordinated Operation Michoacan,” which will include the establishment of checkpoints “in the different cities where acts of violence against the community have occurred,” the secretariat said. Federal Police units, army troops and marines will be deployed across the western state to provide security. “Intelligence, operations and anti-drug units” will be expanded in Michoacan, the Public Safety Secretariat said. La Familia Michoacana cartel leader Nazario Moreno Gonzalez, alias “El Chayo,” was killed Thursday in fighting with the security forces. The operation involving federal officers, army soldiers and marines was launched after an anonymous tip alerted officials to the presence of armed men in the town of Apatzingan, a La Familia stronghold. La Familia was founded in 2006 by the Michoacan cell of the Gulf drug cartel. The rupture within the gang led to an all-out war with the armed wing of the Gulf cartel, Los Zetas. La Familia managed to prosper, however, and bring much of the state’s territory and political structures under its control, analysts say. Official investigators and independent observers say La Familia has created a vast network of informants and promoted the “social well-being” of local inhabitants by funding health care, education and infrastructure projects. Moreno even opened clinics for drug addicts who later were recruited to work for La Familia, and he authored a book considered the group’s “bible” that details the organization’s methods and supposed good intentions. La Familia openly defied the government in the middle of last year with the brutal killings of 12 Federal Police officers, though a letter saying the cartel wants to disband and negotiate a truce with the government was sent last month to media outlets. The missive said La Familia would “retreat and return to our productive activities if the federal and local governments, the police and other authorities promise to take control” of the state of Michoacan firmly and decisively. La Familia stepped into a void left because authorities have been incapable or unwilling to drive “thieves, rapists, drug traffickers and kidnappers” out of the state, the letter said. Michoacan, coveted by drug gangs because of its long stretch of Pacific coastline, has been wracked by violence attributed mainly to La Familia, considered Mexico’s largest trafficker of synthetic drugs and a major source of the crystal meth consumed in the United States. Experts rank La Familia as one of Mexico’s most powerful drug trafficking organizations, along with the Sinaloa, Tijuana, Gulf, Juarez, Los Zetas and Beltran Leyva cartels. Mexico’s cartels are responsible in large part for the violence that has claimed nearly 30,000 lives nationwide since President Felipe Calderon militarized the struggle against drug traffickers after taking office four years ago. Well at least no one has publicly listed the names of the soldiers fallen, I hope? So they don't end up getting there families killed like what happened to La Barbas. Can anyone tell me if the catholic church has come out against this violence and if so,how strong? @jerry a bishop or father something or other came out and said enough guys, your already doing criminal things selling drugs and such, no your desecrating God too, after a shoot out at a festival honoring the Virgin of Guadalupe. he ended by saying they were jinxing them selves.. not unlike the pedophiles they work with on a daily basis. I agree that the church's opinion is pretty irrelevant. These narcos make up their own things to worship they're own way (Santa muerte, malverde, el mas loco, etc.) the catholic church doesn't even recognize those "saints"